Round 11 of the EICC has finished in Yerevan, Armenia. Alexander Motylev was a point ahead of his nearest rivals, none of those - Saric - Fedoseev, Solak - Lysyj, wished to fight for the first place. It may be because overall 23 places let the players to qualify to World Cup 2015. Nonetheless, David Navara who was white against Motylev tried to raise problems, but Russian GM managed to hold confidently. Now Motylev, who is the European champion, will forward his attention to Candidates' and namely Karjakin, whom he is supposed to be helping. Watch all games of the winner. Ivan Saric and Alexander Morozevich strengthened lead after fourth round of the Poikovsky tournament. Crioatian GM grabbed an advantage as white in a rare line of Caro-Kann in the encounter against Pavel Eljanov. Ukrainian tried to save the position but after the decisive breakthrough of the king on e5 square it was already impossible. This is third in a row win of the 23-year-old Saric - the youngest participant of the event. In Round 5 of EICC which is taking place in Yerevan GM Riazantsev defeated GM Najer who was leading. 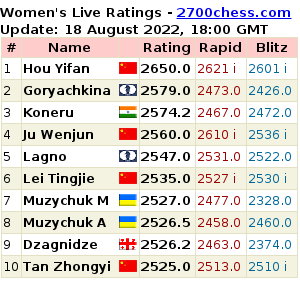 The duel was important not only in terms of tournament position, but also because both grandmasters are coaching Russian women's team. Up to today only two participants of Pikovsky tournament haven't won a single game. 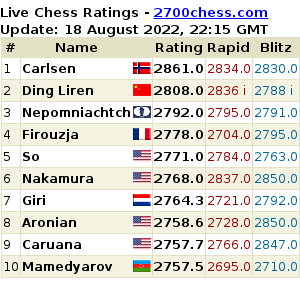 This was changed by GM Shirov in today's round.